Sesame Street has been brought to you today by Guinness Stout. Oh my goodness! Actually, this guest post is brought to you by Jennifer White, self-proclaimed foodie, and soon-to-be culinary school star. When she’s not inventing majesty, such as this incredibly decadent cupcake recipe, she can be found scouring restaurants, food + wine festivals and hopping around the globe eating well. She get’s a big virtual hug for this one – it rocked my socks to the point that we didn’t actually eat dinner the night we made these. Just cupcakes and Patron XO on ice. Now if that ain’t a party, I don’t know what is. I thought I would contribute a recipe that is a sort of ritual between myself and some friends in Miami, but also extremely you-can’t-get-enough-of-it tasty. When I lived in South Beach, there was a group of us dedicated to drinking Guinness. The fridge was always packed and the corner store always sold out. Finally, one day I had an epiphany and thought of what else can we do with Guinness to spice things up, and started making these Guinness Chocolate Cupcakes. The recipe is not for the lighthearted, but you can be sure that when all those unhealthy things come together, it’s going to be nothing but goodness. 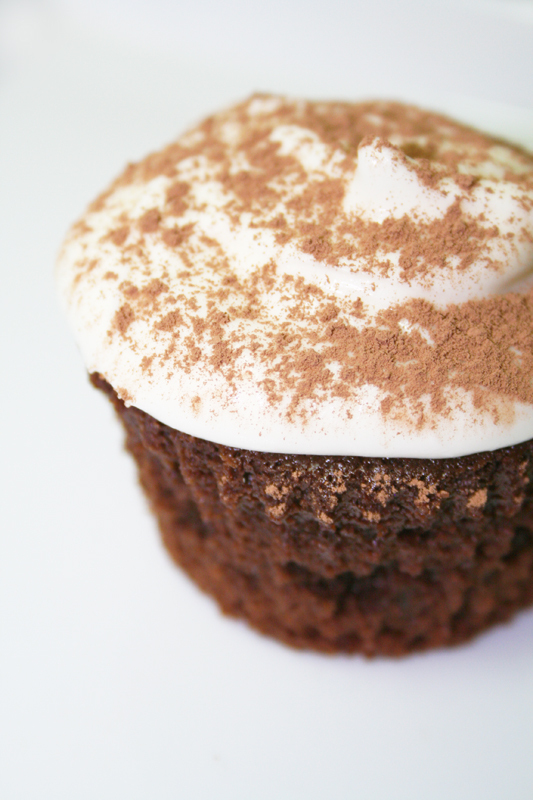 So here is my sacred Guinness Chocolate Cupcake Recipe. You should definitely try it out. Although my original group of friends all live in different parts of the world these days, we always manage to make these cupcakes when we get together. They even look like mini Guinness’ and pair wonderfully with (you guessed it) a nice cold glass of Guinness. Lightly grease 24 muffin tins. Divide the batter equally between muffin tins, filling each 3/4 full. Bake for about 12 minutes on the top rack of the oven and then rotate the pan(s) to the bottom rack. Bake another 12 to 13 minutes until risen, nicely domed, and set in the middle but still soft and tender. Cool before turning out. While the cupcakes are cooling, you can make your icing. In a medium bowl with a hand mixer (or using a stand mixer), beat the cream cheese on medium speed until light and fluffy. Gradually beat in the heavy cream. On low speed, slowly mix in the confectioners’ sugar until incorporated and smooth. Cover with plastic wrap and refrigerate until ready to use. Icing can be made several hours ahead and kept covered and chilled. Jenn uses muffin tins, but for easy cleanup, you may want to pick up some of the standing foil muffin cups from the baking aisle and the grocery. You don’t have to worry about the cupcakes sticking and there aren’t any dishes to clean when you’re done. Cheers!